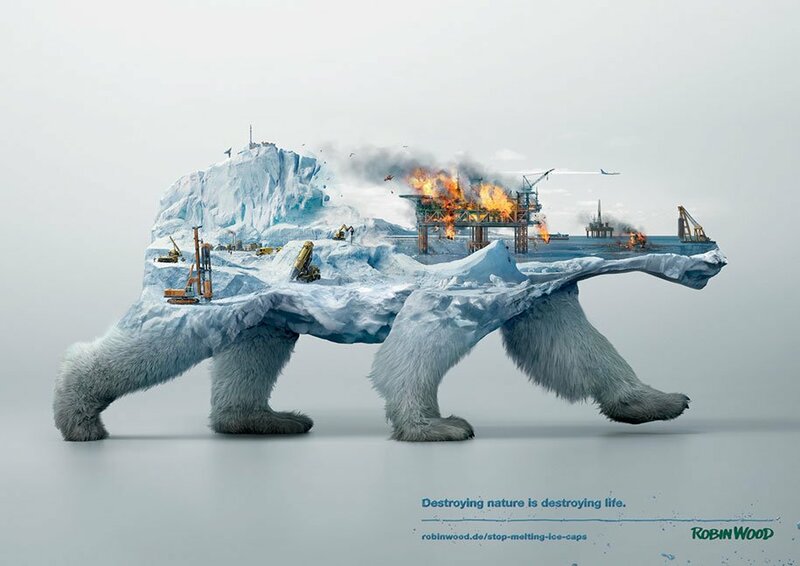 From the arctic drilling killing off the polar bear to deforestation leaving deer homeless, the message is simple, yet powerful: if we continue to destroy Earth’s natural habitats, we will eventually cause our own extinction. 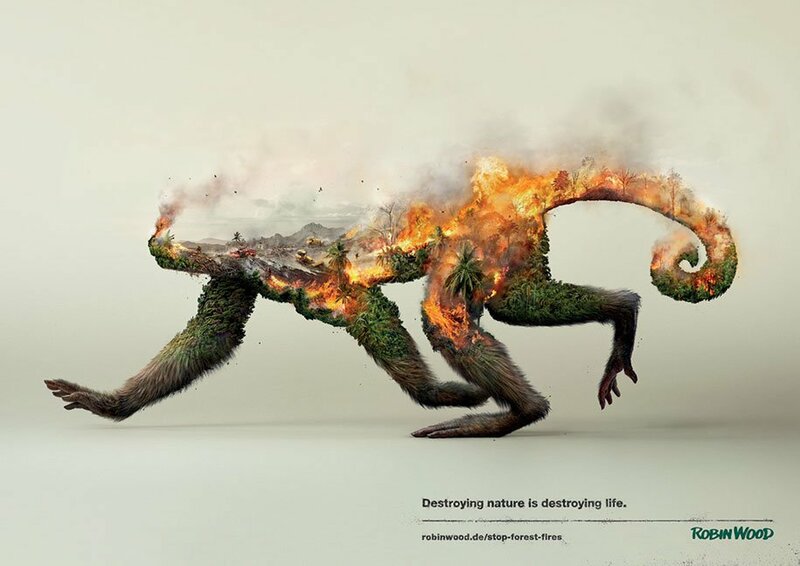 German environmental advocacy group, Robin Wood hired Grabarz & Partner and designer Surachai Puthikulangkura to create a campaign aimed at raising awareness about the detrimental effects of human activity on the natural world. 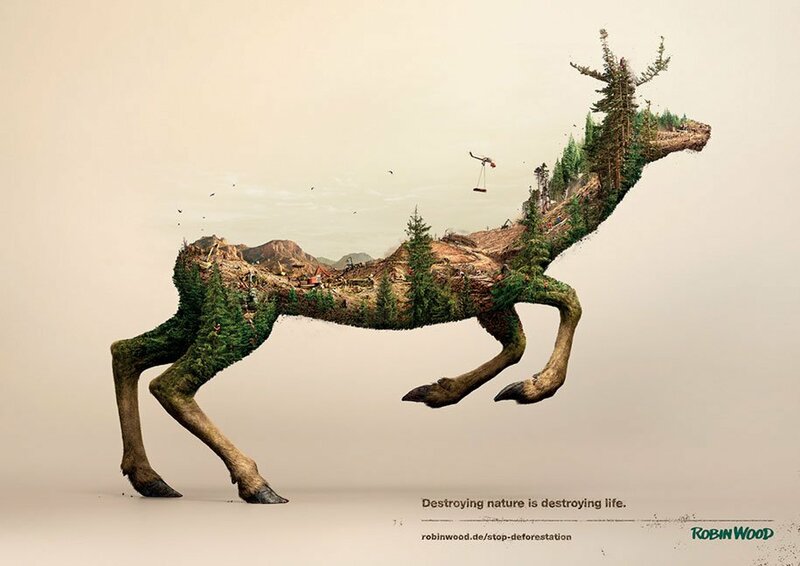 The end result was a series of thought-provoking images titled “Destroying Nature is Destroying Life” depicting three different landscapes that have undergone the most damage due to oil drilling, deforestation, and intense agriculture. In a 2015 study, scientists concluded that even with extremely conservative estimates, species are disappearing up to about 100 times faster than the normal rate – in short, we are now entering the sixth great mass extinction event that threatens humanity’s existence. According to the 2014 London Zoological Society’s Living Planet Index, world wildlife populations have halved in 40 years: populations of mammals, birds, reptiles, amphibians and fish have declined by an average of 52%, while populations of freshwater species have suffered an even worse fall of 76%. So while we know that we are the ones destroying our planet, will we do our share to save OUR Earth and US, while it’s still possible? This article (Stunning Photos that Convey a Powerful Message: Destroying Nature is Destroying Life) is free and open source. You have permission to republish this article under a Creative Commons license with attribution to the author and AnonHQ.com.